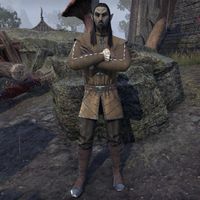 Rolis Hlaalu is a Dunmer found at the writ drop-off points in each capital city. After completing your Master Writ, speak to him to receive some gold and Writ Vouchers. He also sells certain rare goods in exchange for writ vouchers. Blueprint: Hlaalu Gaming Table, "Foxes & Felines"
Note: Struck out items can no longer be purchased from Rolis Hlaalu, but are instead available for a smaller price from Faustina Curio. "If I have to wait around anyway, the least you could do is bring me a pillow." "You ready to drop the goods off?" "You look ready to impress." "About time. Got what I need?" "The artisan arrives. How's work?" "I've got all the time in the world. The client doesn't, of course." "I like to think of this as 'indirect patronage'. So, let's see what you have for our patron." "Come to deliver our little 'private contract'?" "Most clients don't like to be kept waiting. Hurts a reputation, you know." "The longer clients wait, the less patient they become. If you know what I mean." "None of us is getting any younger, you know." "If it isn't the artisan. I'm given to understand that fine work takes time." This page was last modified on 6 April 2019, at 18:31.